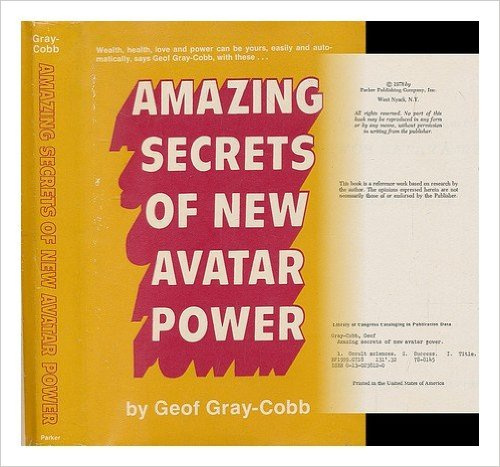 Like a typical hack Parker book, this one starts off with the premise of "What This Book Can Do For You" and it goes into talking about Miracle Of New Avatar Power (From now on NAP will be used for brevity.) Basically he talks about one particular scoffer who said he used NAP and got nowhere with it. In all fairness, the poor slob obviously didn't read NAP very well because it's written so that a teenager of average wits could use it. Cobb (short for Gray-Cobb) allegedly wrote the man and gave him some simple things to do (as pointed out in this work) and then hey he later gets the "Yay this book is great!" letter from the former scoffer. Then Cobb talks about the four doors hiding the secrets of NAP and the first door is "iron" and it requires you read the first chapter to get the keys to unlock this iron door. Okay so what are the first set of keys? Are you ready for this? Believe in the reality of cosmic energy! Wow. What a revelation! *whew* I'm blown away! Then you're to sit in a quiet room, cup your ears and listen to the sound of the blood pumping thru your head. That's teaching you to hear cosmic energy next he wants you to see cosmic energy by putting your thumb & index finger together and pulling them apart slowly - which gives you that sense of seeing strands of energy. Then Cobb goes on to talk about how cosmic energy is the most powerful force in the universe and how Avatar Power is 'holy and pure'. There he steps into the Xian realm of belief in the Devil and God. He discusses the narrowing of a goal such as "I want to win this lottery on that day, bringing in exactly $50,000" instead of just asking for wealth. And there's the first secret of making NAP work - knowing exactly what you want. "Chapter 2 - Inside the Bronze Door: Your Confidential Corporeal Avatar Commands". He starts off with "Psychic Tension May Impede New Avatar Power" and you have to wonder how the hell did he come up with that? LoL Duh.... He persuades you to take time to do the relaxation prior to working your NAP rite. (I agree) Then he discusses the keeping your "confidential corporeal avatar commands" and the first secret is: Confidential = secret, personal, for your ears only. (Shhhhhh!) Then the second key is Corporeal = material, physical, bodily; finally the third key is Commands: authorize, control, rule. This Fear Eradicator technique is really an NLP (Neuro-Linguistic Programming) technique where you imagine the representation of the fear in your mind as vividly as you can but realize it's only an image not the real thing. Then you switch it off and replace it with a memory that has a strong feeling of happiness & contentment. I believe in NLP they called this the SWISH technique except they had a few more steps added but essentially it's the same technqiue. Now is that anything really new? Nope. Silva Mind Control had been teaching that way back in the late sixties and early seventies long before Bandler & Grinder's books or seminars were ever heard of. The Silver Door: The Wonders of Mysterious Avatar Power Words". Boy this was a let down! He starts off with the "n't" words such as "can't, shouldn't, wouldn't, isn't, doesn't, won't" and so on in an effort to make you realize how bad self talk can be limiting. Wow what a revelation. Isn't this what you're Occult authority figures (like moi) have been saying all along? That you shouldn't limit yourself and your beliefs? He suggests you play a game with others where you quickly try and find words to replace the dreaded "n't" words in sentences. Okay nice idea. Simple and easy to grab onto. The next technique behind the Silver Door is "Using the Superb Uncertainty Banisher" which is to mentally imagine the possible outcomes of a desired situation and number them. Then let your Avatar Power make the final decision for you. To some that's not a good plan as they wish to make certain ALL of their decisions are done by themselves and not the subconscious part of the mind which can be quite irrational. Then his next mystic key for the Silver Door is the "Unique Creativity Regenerator" which is (get ready for THIS revelation!) use the blank screen to paint the desired outcome! OMG! How original! Okay yes I'm being rude, snide & snotty and I apologize. What I'm getting at is that this book is definitely not worth the $300-350 price that these used booksellers are asking for it. $75? $100? Okay but $300? Geezuss Kryest that's steep for a book that SHOULD HAVE BEEN released prior to NAP! Don't get me wrong, this is a good book and worth the time to track down a copy but at the price these schmucks are charging for it? If you're a collector of books, then okay go for it; however if you're an Occultist and fan of NAP, then you should think hard about plopping down three C notes to get this. I'm not going to go thru each chapter here and lay it all out for you. That was never my intention. Rather to merely give you an idea of what the book entails before you go and raid your piggy bank for the money that huckster book dealers are charging for this. Yeah I can hear you guys out there, "Boy I wish someone would PDF this!" and you know what? It may happen. I'm not an advocate of it but let's face it, Cobb ain't getting any royalties from this book today and as old as he is, once he's gone I'm not sure who'll hold the rights to this book and his other works. But if you're interested in solid metaphysical techniques that work and are more affordable than this, go to my own Basics of Metaphysical Empowerment" and order yourself a copy. That booklet will have everything you need to make NAP and any other Occult spell, rite or ceremony work for you! © 2007 MolochSorcery ALL RIGHTS RESERVED - NO PART of this page &/or website may be copied in any form whatsoever or reposted to any other forum without the expressed written consent of the site owner!